This handbook was published by the C.S. 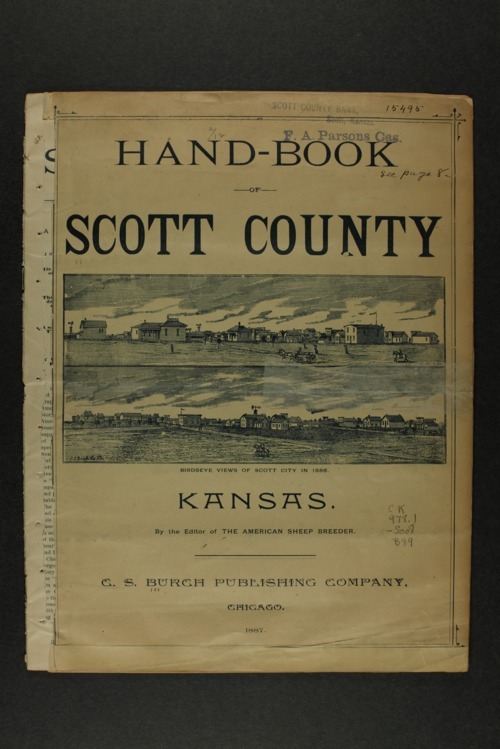 Burch Publishing Company, Chicago, Illinois, to encourage settlement in Scott County, Kansas, and the Upper Arkansas River Valley. The publication has extensive descriptions of the land and natural resources. Given that this is western Kansas, the amount of rain fall is a topic of interest in the booklet. It includes a short history of the area. Descriptions of the various businesses in Scott City are provided. Information about several local organizations, such as churches and the Woman's Christian Temperance Union, is included. There are also a number of illustrations of businesses, homes, and farms.